The “collars” of a fish are most often thrown away with the carcass of your catch, but your missing out on an amazing treat. 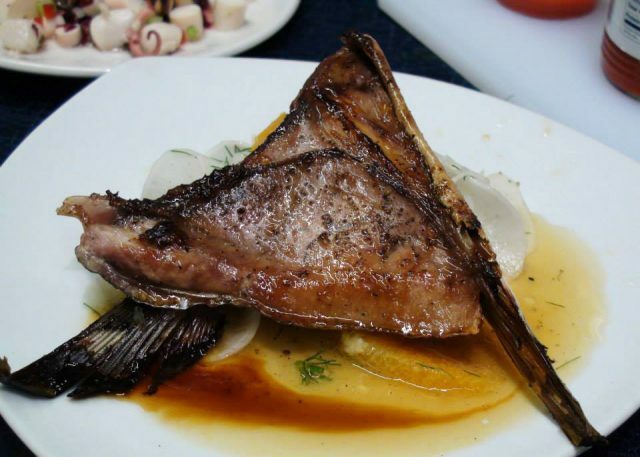 The “throat area” of the fish including the pectoral fins is a plump, meaty part and here is a recipe from Chef Jenn Felmley that was shared with Collaboration Kitchen. In a saucepan over medium low heat combine mirin, ginger and garlic; reduce mirin till thick syrup (should coat the back of a spoon). Reduce heat to low and stir in soy sauce, lemon juice and orange juice; simmer for 5 minutes. Divide sauce into 2 bowls. Lightly brush fish collars with oil and sprinkle both sides of fish lightly with salt and pepper. Preheat a grill or grill pan to medium heat. Place fish onto the grill flesh side down, grill till golden brown crust forms (about 5 minutes). Flip fish and grill skin. Cook for 5 minutes and reduce heat to medium low heat. Brush the fish with dipping sauce and grill for 5 more minutes, brushing with sauce several times during the 5 minutes cooking (to coat collars in sauce). To serve; spoon the remaining sauce over the fish collars and serve with the side of your choice. *If you don’t like spice replace the Rayu (or Hot Sesame Oil) with sesame oil.